Now the kingdom of heaven is like a landowner going out at daybreak to hire workers for his vineyard. 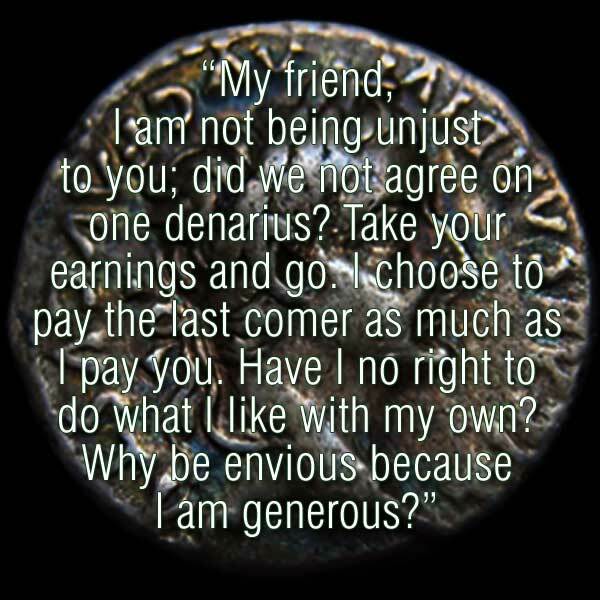 He made an agreement with the workers for one denarius a day, and sent them to his vineyard. Going out at about the third hour he saw others standing idle in the market place and said to them, “You go to my vineyard too and I will give you a fair wage”. So they went. At about the sixth hour and again at about the ninth hour, he went out and did the same.Then at about the eleventh hour he went out and found more men standing round, and he said to them, “Why have you been standing here idle all day?” “Because no one has hired us” they answered. He said to them, “You go into my vineyard too”. This is a strange story about people being paid a lot for doing little. About idlers rewarded. People are paid the same at the end of the day as if they worked all day. The key is in the last line…I give what I want…God’s ways are not our ways. But more – about the generosity of God delighted to give fully to everyone. And Jesus gets his message across with a story that has us asking questions all the time. God is generous with his love. Even at the worst of times. When we feel the worst, we may know the best of God. God is love and generous even when you feel hard done by life. That lasts. And gives God joy. He felt really good that they all had enough for the day. That’s all he ever promises. So much of modern thought that gets popular is about the now…live in the now. Catholics can get stuck in the past with guilt, and always looking for a better life later. The now is all we have now of God. God gives his love fully in the now without conditions. God always seems to live in the now. In the desert he gave enough for the day, and no more. Our problem can be that we always want to get more – and the parable today is that we get enough for a day at a time. This is the wisdom of any good spirituality; and if we live that way for one day, we can live the next. For the next day is always the now, nothing more nothing less. This entry was posted in Gospel of Matthew, Gospel Reflection, Liturgy Resources, Prayer Resources, Scripture and tagged Donal Neary SJ, generosity, God gives fully to everyone, Gospel Reflection, last will be first and first will be last, living in the now, Matthew 20:1-16, Sunday Gospel Reading and Reflection for 21st September 2014, Sunday Scripture and Reflection for 25th Sunday Ordinary Time Year A, Unconditional Love. I like your reflections you are doing a good job. Please be sending me each week reflection via this mail. Thank you. Thanks for the reflection on today’s gospel. I definitely understand the infinity of God’s love and how He chooses to share His love without conditions. In my opinion, this works well when talking of our daily spiritual nourishment from God. However, when talking of physical / material nourishment which is part of our day-to-day living, my only difficulty is how to balance your advise of “living the now” with today’s generally accepted good habit of saving or planning for the days to come. As you are aware, the key force driving man to do better and develop new things is his natural “greed” to have more today to enable him to be better prepared for tomorrow. How can I pass your message to my child without giving the wrong impression that I am encouraging him/her to be lazy/irresponsible and not work hard to prepare or save for tomorrow?